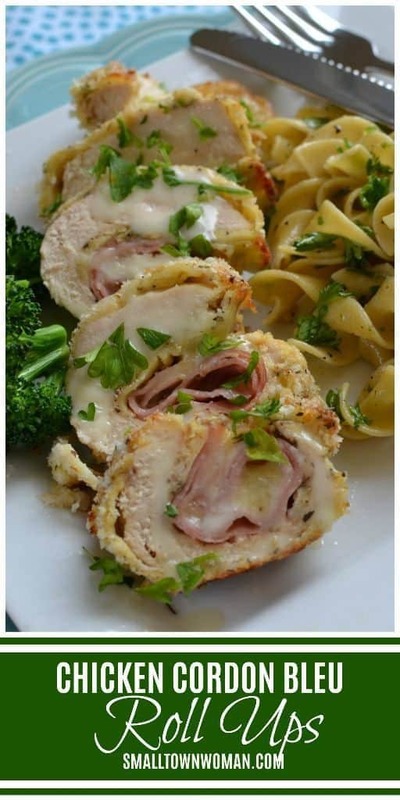 Chicken Cordon Bleu Roll Ups are crispy breaded chicken breasts stuffed with ham, Swiss cheese and drizzled with a mustard Parmesan cream sauce. Chicken is by far one of the most versatile meats. We probably eat chicken one way or another at least twice a week. There are just so many ways to bake it, grill it, stir fry it and saute it. Everyone needs a large repertoire of great go to chicken recipes. 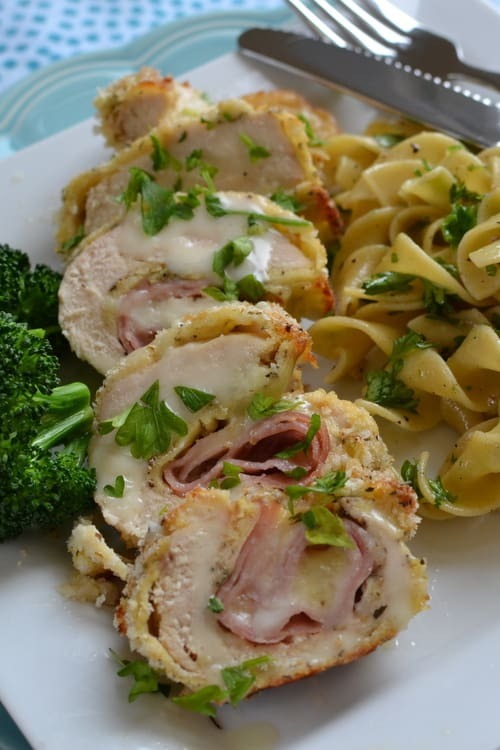 These Chicken Cordon Bleu Roll Ups are one of my favorites. They are scrumptious, easy and so dependable. They are simple enough for a weeknight meal yet elegant enough for company. See what I mean!! Don’t they look savory and scrumptious? The chicken is stuffed with baby Swiss cheese and sweet ham. Then it is breaded with crispy panko crumbs and baked to a golden brown. Just before serving drizzle with the easy mustard Parmesan cream sauce. Are you always on the hunt for more amazing chicken recipes? I mean really, who isn’t? Don’t worry I got you covered! Some of these delicious chicken recipes are mine and some are from my blogging friends! 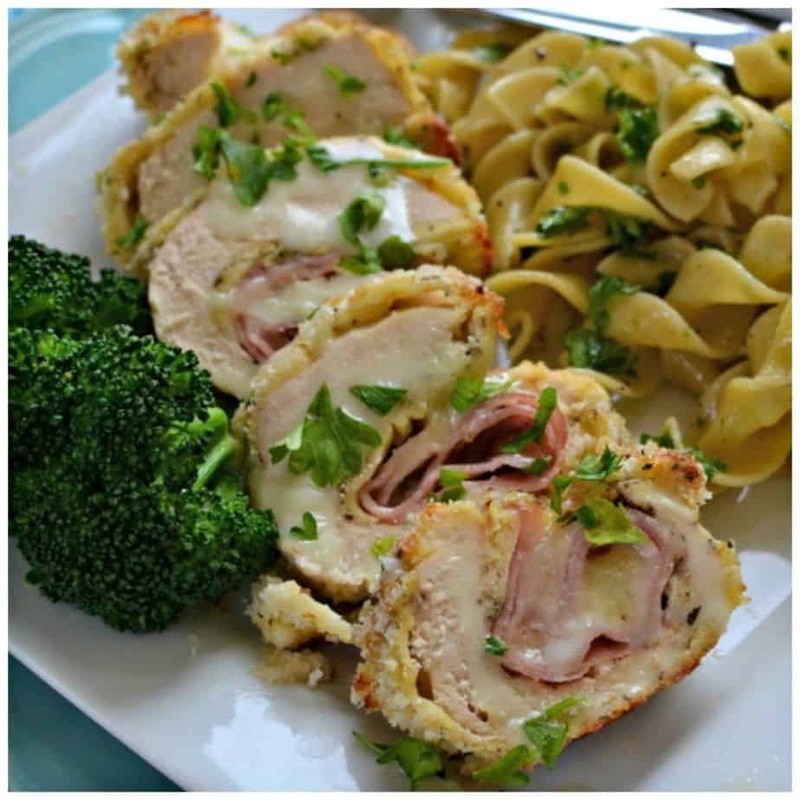 A few helpful hints for making these Chicken Cordon Bleu Roll Ups! If the chicken breasts are still too thick to roll after cutting in half lengthwise pound them a little thinner using a meat mallet. Use panko bread crumbs for extra crispiness. Don’t drizzle the sauce until you are ready to serve. 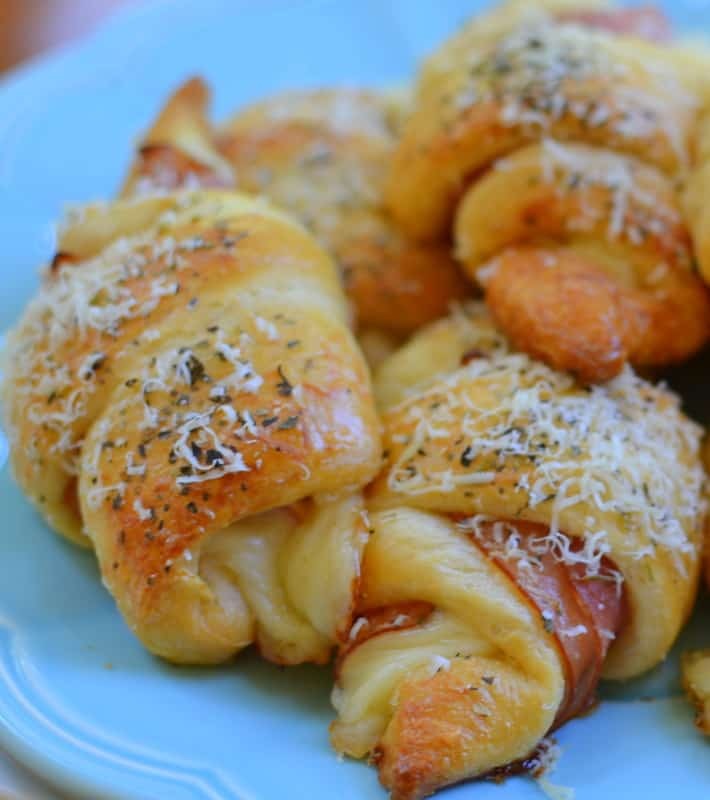 Put the ingredients for these Chicken Cordon Bleu Roll Ups on your list today and give them a whirl. Your family will be singing your praises and coming back for seconds. This post was originally published Feb. 6th, 2015. It was republished June 4th, 2018 with more updated information, modified creamy Dijon mustard sauce and newer pictures. Whisk eggs and 1 tablespoon milk in small bowl. Add flour to shallow plate. Combine panko, basil and oregano on separate shallow plate. Place one piece of Swiss cheese on each piece of chicken. Top with a piece of ham on each piece of Swiss cheese. Roll up chicken breasts starting on shortest end and secure with toothpick. Dip each rolled chicken stack in egg mixture, then in flour, back in egg mixture and then in the breadcrumbs. Place on cookie sheet and bake for 25 – 35 minutes or until chicken is no longer pink. Remove and allow to cool for 5 minutes. Melt butter over medium heat. Whisk in flour and cook for 90 seconds: whisking constantly. Slowly whisk in milk and cook until slightly thickened; about 2 minutes. Turn heat to low and whisk in Dijon mustard and Parmesan cheese. Cook until cheese is melted; whisking constantly. 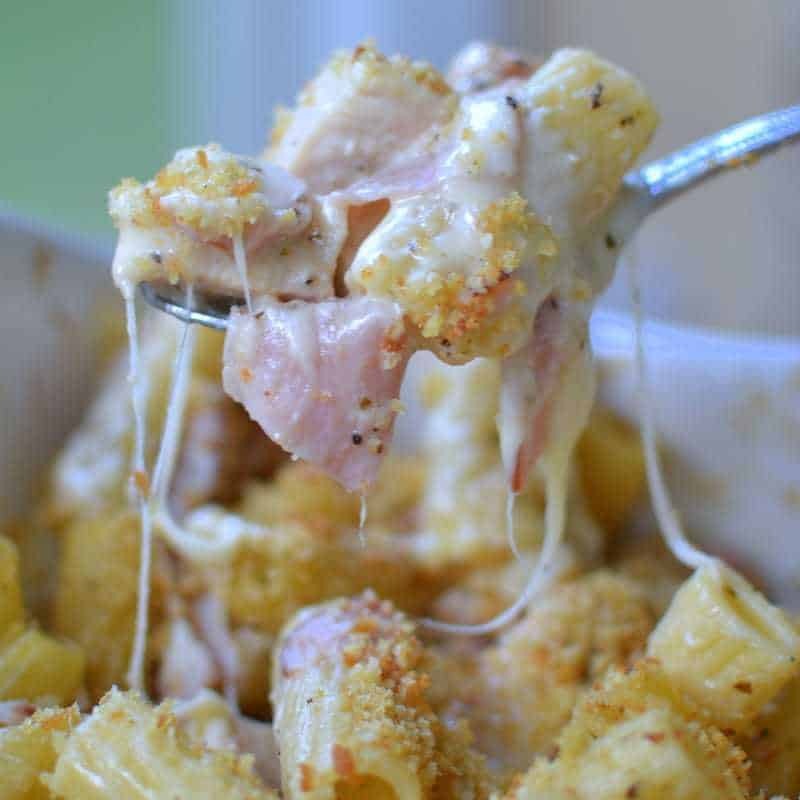 Slice chicken into rounds, drizzle with cheese sauce and sprinkle with parsley. What is provel and is there a substitute for it? I’ve never heard of it. Provel is a combination of cheddar, provolone and swiss. If it is not available in your neck of the woods use provolone. Happy cooking! Looks like a yummy recipe. I’m going to try it this week. Thank you for sharing! My pleasure Nancy! Happy cooking! “Small town woman” should read “St. Loius Gal” after researching Provel. Goggle “Provel” and you will learn it’s a St. Louis concoction. So true and so funny Susie!!! Actually I live about 50 miles out of St. Louis but we still have it available here. Provolone is a good substitute and a close second! looks awesome definitely going to try it! Thanks so much for the complement. Happy Cooking! after I make these can I freeze them? I have never tried although I don’t see why you couldn’t.